If you look into your horse’s mouth, you might notice that there are a few teeth in there that seem different than the rest. The front teeth are called incisors and these are the teeth that horses use to snip of grass and plants that they eat. Then there is a gap. This is called the bars of the mouth, and it is also where the bit will sit. Behind the bars the premolars begin, and behind the premolars are the molars, all of which are used to crush the grass the horse has sniped off with the incisors. But in front of the premolars, sometimes tucked very close to the other teeth, there may be small stubby teeth that don’t appear to have any function. There may be tushes or canine teeth. These teeth may grow midway along the otherwise toothless bars of the mouth. Or there may be wolf teeth. The wolf teeth are small, often pointed or peg-shaped, teeth that grow just forward of the horse's first premolars. While tushes are usually only seen in male horses, wolf teeth are common in both males and females. These teeth push through the gums when the horse is between five and twelve months old. They may only emerge from the top gums, but some horses may have both upper and lower wolf teeth. Unlike the incisors and molars, these teeth do not continue growing. They stay relatively small throughout the horse’s life and will not become overgrown or wear unevenly as other teeth might. Occasionally, they may not erupt completely through the gums, but stay small bumps just in front of the molars. These are called blind wolf teeth. These teeth, like the tushes, are vestigial teeth, and along with the chestnut and ergot are evidence of how horses have evolved over time. 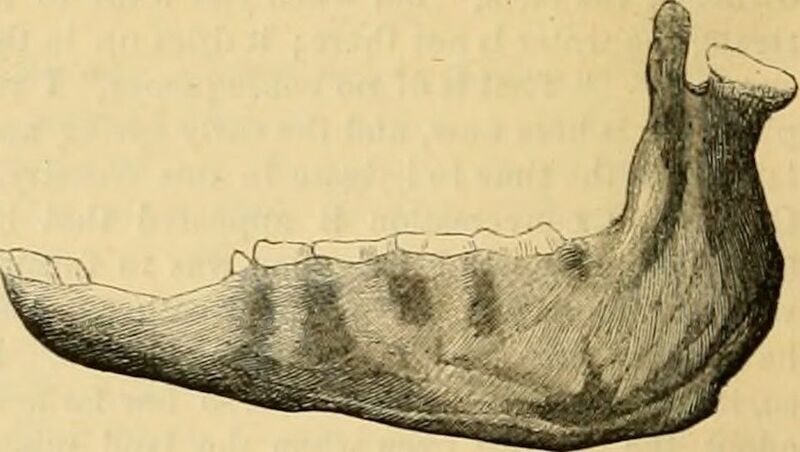 These small teeth are left over from a time when a horse had a jaw-shaped more like a goat or deer. They are not called wolf teeth because they are in anyway wolf or dog-like. Horses have never been meat eaters. Although these and the tushes appear to be shaped like the ripping teeth of a carnivore, they are not true canine teeth. Wolf teeth may never present a problem. In many horses, they don’t interfere with the bit mouthpiece, especially if the teeth only erupt on the upper gums. But, if they interfere with the bit, they may need to be removed so the bit sits more comfortably in the horse’s mouth. Wolf teeth can also become ulcerated, or infected. Wolf teeth have nerve endings in them, so even if at first they don’t seem to be causing a problem, they may become sensitive. If a horse starts to toss its head, especially when the rein aids pull the bit against the teeth, sensitive wolf teeth may be the culprit. Because this problem can crop up at any time, some people routinely have them removed. If this happens, they may need to be pulled and the horse will need antibiotics to clear up the infection. A tetanus shot is also recommended if the horse does not regularly get this vaccine. This operation should only be done by a veterinarian or qualified equine dentist.